Wishing all my readers a very happy and peaceful new year!. I made these fancy chocolate banana split cupcakes last week for my friend’s daughter’s birthday. I got the original recipe from here but made some changes to bake an egg less version of the same. The cupcakes were a super hit with everyone. I only wished it made 12 cupcakes because I just got 8 of them and it was all gone in no time. 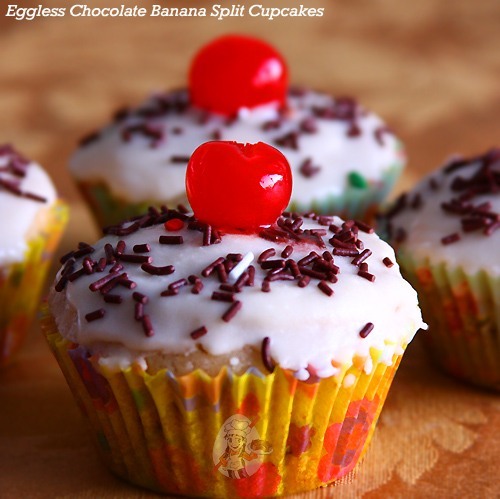 These decadent egg free chocolate banana cupcakes will become your “go-to” recipe for every special occasion if just try it once. Preheat the oven at 350F/180C for 15 minutes. Line a 12-cup muffin tin with paper liners. In a large bowl mix together dry ingredients and set aside. In another bowl stir together the wet ingredients. Add to the dry ingredients and stir until just combined. Fold in the chopped nuts. I added 2 tablespoons of milk because I felt that the batter was quite thick. 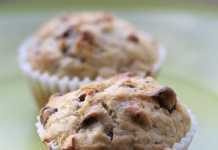 Place a tablespoon of the batter in a muffin cup. Top it with 1/2 tablespoon of chocolate chips and fill the cup with two-thirds full of batter. Repeat the same for the remaining batter too. I got only 8 cupcakes. Bake the cupcakes for 20-25 minutes or a toothpick inserted in the center of the cupcake comes out clean. Mine was done in 20 minutes. Cool it on a wire rack completely before frosting. For frosting, combine all the ingredients together (and some more sugar or milk as needed) to achieve a spreading consistency. Frost cupcakes, top it with some chocolate sprinkles and a cherry. The original recipe called for milk chocolate bars to be placed in the center which I replaced with chocolate chips. 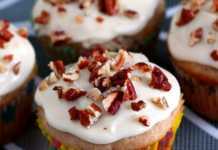 You can totally make these cupcakes vegan by using the substitutes I have given above. Just tried it out and… yummy !! Thanks for sharing the recipe! These cup cakes look amazing. It would be great if you can also show a picture of the cup cake thats open and cut so we can also see the texture. Thanks Shoba. Will do it from the next time onward. 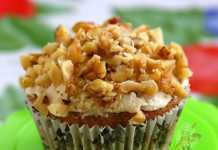 I made this yummy cupcake with almonds instead of pecan. It came out really good and going to be my favorite cupcake recipe. Thank you for the recipe.